A bit more than a month after the XXXHOLiC◆Kei event took place at LOFT/PLUS ONE, formally known as XXXHOLiC◆Kei Previous Evening Festival, the website CLAMP-PLA.NET brings their report of the event (most likely the last one for this event). I was long awaiting for it, you can check it after the cut. Code Geass – Lelouch of the Rebellion R2 premiered yesterday in Japan and you can get the RAW of episode 1 via TokyoTosho from many different sources. You know the steps, just type Code Geass in their search field to get the results. You can download the full ED sequence, featuring these and other illustrations, here (.AVI, 26 MB). Credits for the rip goes to Memento. The illustrations are just beyond gorgeous! 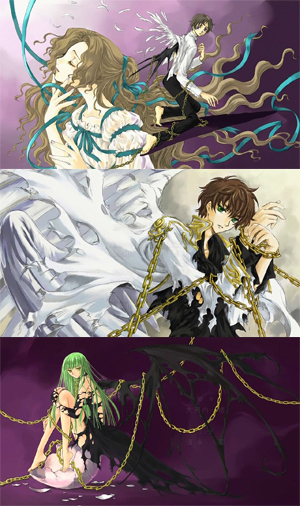 It’s basically Code Geass through CLAMP’s eyes xD The drawings were done by Mokona but Nekoi painted them using CG. I was surprised with the total amount of illustrations, I thought they would be fewer. Beautiful work, CLAMP. Amazon.co.jp has a list for all the upcoming XXXHOLiC◆Kei DVDs. There will be 7 volumes, and each one of them will have a limited edition coming with a Drama CD and a booklet. The first Drama CD will be written by Nanase Ohkawa. First edition limitation: Post card, booklet and Drama CD scripted by Nanase Ohkawa. First edition limitation: Booklet and Drama CD. Thanks to for the heads up! More information, such as extra features or a box to hold the DVD cases, can be added anytime. Basing on the DVDs running time that Amazon.co.jp is reporting, XXXHOLiC◆Kei will have only 13 episodes. I’ve been seeing this (quite a lot) in articles and interviews about the the new season, but I thought the series could be expanded to 26 episodes when we get halfway through it. But after this, I’m getting more and more convinced. So for now, 13 episodes only. Last but not least, ASCII.jp has their report on the XXXHOLiC◆Kei event at LOFT/PLUS ONE (they have a bigger version of the CLAMP and Mizushima picture), and Hobby-Channel has an article about the XXXHOLiC◆Kei stage event at TAF2008. Phew! The ASCII article states that, up to the event’s day, Episode 1 was done, Episode 2 was in the middle of after-recording, Episode 9 was being drawn and Episode 12 storyboarded. Dengeki has a VERY NICE coverage of the XXXHOLiC◆Kei event that was held at LOFT/PLUS ONE on last March 15. The article has a transcript of the press conference that was held in the event, and it includes several great pictures. Make sure to check it out! 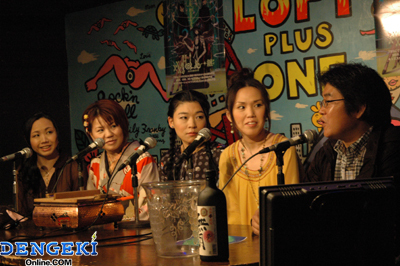 The XXXHOLiC◆Kei event was held this Saturday at the LOFT/PLUS ONE talk live house, in Tokyo. My friend (and japanese correspondent xD) Yoshiyuki was there and he gave me a general idea of what happened at the event. He also did a great move and recorded the audio of most of it, it’s all behind the cut. 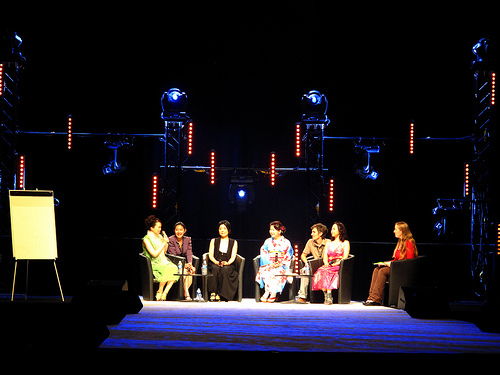 Guest: Inada Tetsu (Kurogane’s seiyuu).